The Holy Cross Wilderness is a U.S. Wilderness Area located in San Isabel and White River national forests near Leadville, Minturn, Avon, Edwards, Eagle, and Vail, Colorado. 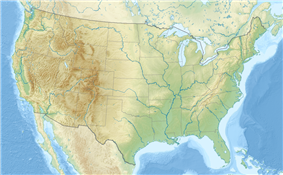 The 122,797-acre (496.94 km2) wilderness with 164 miles (264 km) of trails was established in 1980. The wilderness was named after its highest peak, 14,005-foot (4,269 m) Mount of the Holy Cross. The Holy Cross Wilderness has a history of many hikers, often those who are unprepared, becoming endangered. Primarily, the hikers who require rescue are unfamiliar with the risks of entering wilderness areas and do not bring adequate equipment and supplies to respond to emergency conditions. Hikers are frequently stranded or lost due to changing environmental conditions and confusion regarding the surrounding landscape. Holy Cross Wilderness visitors should carry adequate provisions, the ten essentials, including water, food, firestarter, guide book or map, global positioning device, layers of clothing, headlamp, knife, and cell telephone. Thorough research and reasonable planning should prevent most tragedies. Holy Cross Wilderness hiking trails include Nolan Lake Trail, Lake Charles Trail to Lake Charles and Mystic Island Lake, New York Mountain Trail, Dead Dog Trail, Middle Lake Trail, Beaver Lake Trail to Beaver Lake and Turquoise Lake, Fancy Lake Trailhead in person (or Fancy Creek Trailhead as the maps say) Grouse Lake Trail, West Grouse Creek Trail, Martin Creek Trail, Notch Mountain Trail, Half Moon Pass Trail to Mount of the Holy Cross, Tuhare Lakes Trail, and Cross Creek Trail to Treasure Vault Lake and Blodgett Lake. Holy Cross Wilderness Area: Northern Trails of Eagle County, a hiking guide by Kim Fenske, describes these trails. ^ "Holy Cross Wilderness". Wilderness.net. Retrieved August 10, 2012. ^ "Search called off for missing hiker in rugged Holy Cross Wilderness". The Denver Post. October 15, 2010. Retrieved August 10, 2012. ^ Lynn, Steve (August 2, 2007). "Lost hiker braves wind, cold in cave". Summit Daily. Retrieved August 10, 2012. ^ Fenske, Kim (2010). 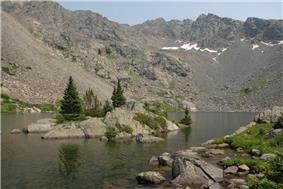 Holy Cross Wilderness Area: Northern Trails of Eagle County.